Posted 24 August 2016 & filed under 1940s, 1950s, 1960s, Work. Can anyone remember the coalman in Cottonmill and St Julian’s? I asked this question on Facebook and received many replies. Thanks to my many FB friends for sharing these memories. 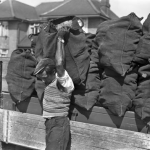 Many people have memories of the coalman who used to come round the estates in the 1940s and 1950s. Children were instructed by their parents to stand at the gate and count the bags in. Martin Parles remembers: “We used to count them from the cellar, where they were tipped into from an outdoor chute. It took hours for the coal dust to settle, nice smell though.” Many remember the smell of coal as being quite pleasant although it must have been very sooty. Brian Gilson’s dad was a coalman. He worked for Martell’s when they lived in Wilshire Avenue in the late 1940’s and early 1950’s. Donvill Crouch remembers Syd Broadwell and Johnny McCarthy who were coalmen in St Albans. Sue Freakes says her dad was a coalman and she remembers that he used to deliver to the Spielplatz naturist colony with his mate Jimmy Mardel. Sheila Greenall’s father was a coalman before he went into the army. She remembers picking up the spilt coal in Wilshere Avenue. Donna Clarke’s father was a coalman too. Kenny Blackman remembers that his Mum used to have coal delivered by Day Bros. The firm still exists and is based Colney Heath. Jim Mattison said they used to leave a sack at his Nan and Granddads’ house in Cottonmill Lane and that he would go around daily to load the scuttle for the day. Linda Chubb said: “We used to order ours from the merchant by the train station. Ours was kept in a shed which dad had boards across the door gap plus we had a bunker too. Love the smell of coal. Sometimes he would go down to the gas works and buy coke.” Mary-jane Ng’s father still has his old coal and coke bunker: “when I was a little I use to like sitting on it – though I won’t now as I’d go through the lid as it needs knocking down!! !” Mick Scottow’s uncles Bert and Roy Snow used to deliver their coal so they always had an extra bag. Many people got their coal and coke from the gasworks. Deanne Seabrook said that Dickie Bird delivered their coal and they got a good deal as her father worked at the gasworks. Dickie lived in Wilshere Avenue.